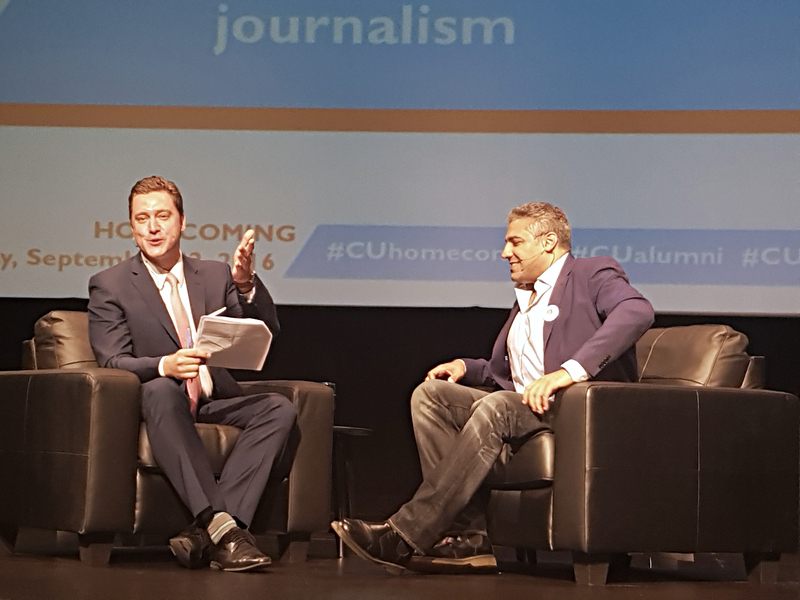 Concordia University welcomed Egyptian-born Canadian journalist Mohamed Fahmy as a lecturer for the first in a series of homecoming lectures at the Sir George Williams campus on Sept. 22. Just over one year ago, Fahmy was released from prison in Cairo, Egypt. He, along with two of his colleagues, were accused of being terrorists, he said. They were arrested in December 2013, and found guilty in June 2014, staying incarcerated for over 400 days. Fahmy also spent six weeks in solitary confinement. To a full house at the D.B. Clarke theatre, Fahmy spoke about his experience in prison and his campaign to free other journalists in similar situations. Fahmy detailed his experience working at various news stations prior to his arrest—namely CNN, the BBC, and Al-Jazeera, where he worked as an English bureau chief in Cairo. Three days later, there was a knock on his hotel door and security forces stormed in. He was falsely accused by the Egyptian government of supporting the Muslim Brotherhood—a banned organization. “My prison neighbors were members of Al Qaeda, ISIS, the Muslim Brotherhood—as a journalist, I was in heaven,” he said jokingly. The audience laughed. During the conference, Fahmy was interviewed by Paul Karwastsky. Photo by Cristina Sanza. To occupy their time in prison, the jailed journalists conducted interviews with the different members of these organizations. “We would interview them on their political views, and in return they would do the same,” said Fahmy. Fahmy got tons of support from not only his family, but from the Canadian press and via social media, which all lead to his release. “It was unbelievable to see the Canadian press uniting under this one cause,” Fahmy recalled. He said social media played an important role in raising awareness and getting Canadians involved. Throughout his time in prison, his family started a crowdfunding campaign where he was able to raise $40,000. With the money, Fahmy was able to pay the bills for his lawyers. Despite the gravity of his situation, Fahmy did not lose hope and managed to stay positive. He said he read Viktor Frankl’s Man’s Search for Meaning, a chronicle of the author’s experiences as an inmate at the Auschwitz concentration camp during the second world war. This book taught Fahmy the concept of tragic optimism, which inspired him to turn his prison time into somewhat of a positive life experience, he said. After being pardoned of all charges in September 2015, he and his wife started the Fahmy Foundation, with goal to fight suppression of the press and to advocate from unjust imprisonments around the world. He said he is currently working on passing a protection charter with Amnesty International to ensure greater advocacy for Canadians overseas. “We need a mechanism to obligate the government to protect our people.” said Fahmy. “Not only journalists are being falsely accused … we see this happen to regular people and recently, with Homa Hoodfar.” Homa Hoodfar is a Montreal academic who has been imprisoned in Iran’s Evin Prison since June. Fahmy said he believes there should be a change in the way government deals with these problems, and that it is urgent. “She is sick, and she needs support from everyone,” he said. Fahmy’s complete journey will be detailed in his upcoming book, “The Marriott Cell: An Epic Journey from Cairo’s Scorpion Prison to Freedom,” which will be released on Nov. 15. Be sure to check out The Concordian‘s exclusive interview with Fahmy in print and online on Sept. 27.